This thread will cover the last School Board meeting last Wednesday, Feb. 5th. All directors were in attendance but Director Carr. The Rainier Beach High School T.E.A.L. team (Technology Education and Literacy in Schools) gave a presentation on coding work they have been doing. There was a large crowd primarily around transportation, former Center School teacher, Jon Greenberg and the NW Center Kids program. an APP student at Lincoln had a video he/she had made about the Seahawks featured on the Today show. he tried to placate the NW Center Kids folks by praising their work since 1982. This was good but then his phrasing "a couple of years ago we noticed growing enrollment." Just noticed? It was more like seeing a tsunami coming. He said they are working on "options." he said the Board would be voting on a new contract for Local 609 workers that includes nutrition, custodial, security and response staff. he reported that Standards and Poors gave SPS a AA bond rating which is the highest for all districts in the state. Facilities manager, Dr. Flip Herndon, gave a brief report to the Board about the issues around BEX IV and the funding. They are using BEX III "seed" money for current BEX IV funding. (See that mixing of the pots? Makes it very hard to track what money was spent where.) The district has not received any BEX IV money yet but will get a small amount this month from those who pay their taxes early. He said there should be $60M by May and another $60M in October. The frustration was that, despite the fact that the report was not aligned with Board policy on it, the Board said very little. Ms. Garmoe stated that there were no structures or systems in place for this work and she had just been hired in November. I can certainly understand the statement about no structures simply because we've yet to see a full-fleshed out, Board policy-compliant report. My frustration is in hearing person after person, at meeting after meeting, say, "I just got here" as a reason something didn't get done properly. Director Peters said that Advanced Learning and Special Education parents were "anxious for a clear vision of placement." She asked if the report had solid information on these issues. The answer was no. The director of Special Education said they are working with enrollment planning and looking at Sped projections and couldn't provide a date but said they were "very close." President Peaslee noted the lack of community engagement in some areas. Staff noted there were in some places but yes, "we want to do that in future reports." Well, it actually isn't a choice of "wanting to" because it's Board policy. The Board will need to hold the staff's feet to the fire in the future (but don't hold your breath). Topics included later start times with yet two more sleep professionals weighing in, one a UW nursing instructor who talked about puberty sleep patterns and the other the director of sleep medicine at Swedish. He argued that the current start times hurt students in many ways but that they hurt disadvantaged students most. Another topic that was passionately argued was about the NW Center for Kids with a pediatrician who does work with the Center saying that 35% of the children are special needs. He said it was unfair that the district only gave 6 months notice for a group who had been helping special needs students for 28 years. There was also an argument against moving the Center because 95% of the parents are north of downtown. (I will note here that this issue of WHEN notification took place is key. Overall, I feel the district - because the Center is serving students that the district itself would otherwise have to serve - should be helping them find a suitable space or allowing them to stay where they are. This group spent $250,000 in September to upgrade that space and I seriously doubt that any group would spend that kind of money - and they did let the district know they were doing it - if they truly knew they were under threat of non-renewal of their lease. There were many teachers in attendance in support of Jon Greenberg (who, because of the ban on speaking specifically about personnel, was He Who Shall Not Be Named). One teacher said that teachers feel unprotected by the district over a "poor investigation over one anonymous action." It was also stated that new City Councilwoman Kshama Sawant asked about the status of the program developed by Mr. Greenberg and had been told the program still existed. The teachers said that was simply not true. 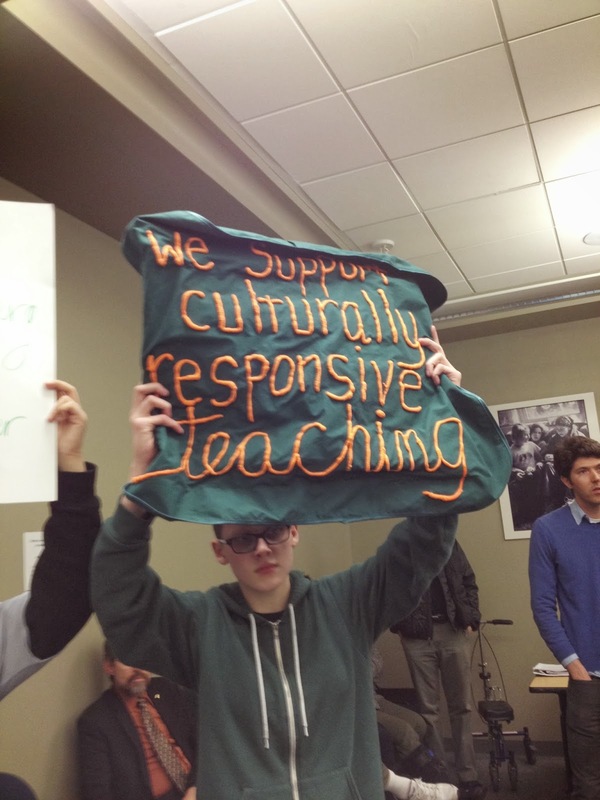 This group annoyed President Peaslee by speaking out of turn and challenging the Board on statements on this issue. There were two oddities in the speaking list and that was two different people from non-profits that do support work for students. Both said they had to have access to student data in order to do their jobs and support students. They both said they followed FERPA guidelines (which don't mean a lot these days). And this is PRECISELY why I am worried about student data privacy. What kind of guidelines is the district giving vendors/contractors about what they say about students? She was making a determination about data that wasn't hers to make. At a public meeting, she gave very specific data about a student. I checked into her group and, to my astonishment, found a student name and photo (whether it is real or not, I'm not sure) and additional sensitive information about the student's family. I personally find it hard to believe that a family would put out that kind of information no matter how much they were being convinced it would help other students. Martin-Morris - C'mon take a wild guess what he opened with? "I just got back from D.C. several days ago from a meeting." Of course he did because that seems to be his mission - to go to out-of-town meetings and "report back." I'm not saying that what he is doing is wrong but I'm not seeing how it plays out in the running of this district. Is this really the best use of his time as a Director? McLaren - She said that yes, staff is hearing parents on the issue of transportation. She said that she was not scheduling a lot of meetings because of her chemo treatment and she appreciates all the good wishes. Blanford - He said he had received a tremendous amount of e-mail and had deep concern for your positions. Patu - She thanked the RBHS coding team for coming. She also said six months was not enough time for the NW Center for Kids to find a new space. What form did the report from Martin-Morris take?. When I asked staff they pointed me at three written reports he made in 6 years. He should be writing up every trip he goes on, especially since many are paid for by the district. I understand occasionally be makes brief verbal reports - but I believe the board members and those to come would be better served by a comprehensive set of reports detailing what he learned. These are not photo-ops!. Concerned, I have no idea. I've never seen any of these "reports" either. If you go to the "School Board" page on the SPS website, and click on Director Martin-Morris' link on the bottom, there are links to reports/summaries of the various conferences he has attended. I believe those are the reports he refers to during his Board Comments. I watched last week's meeting on TV. I was, frankly, appalled that $500K of last-minute exceptions and tier changes made it into the Transportation Service Standards before it was approved. I will have to double-check, but I think all were directed towards option schools. Only $200K-worth of possible revisions to the plan were brought up as options during the work session a few days before. I understand the reasoning of why some of these exceptions and tier changes were done, but there was no breakdown of what each revision cost, nor was there ANY Board discussion on how they went from $3.4M savings down to $2.9M savings. This does not seem like responsible oversight. Director Martin-Morris did ask about the JAMS/Hale alignment and was given a confusing explanation of how the Hale buses were all SpEd buses, and they couldn't consolidate transportation between Hale and JAMS (I don't remember asking them to put middle schoolers on the same buses as high schoolers???). They claimed aligning the JAMS/Hale transportation schedule would cost an additional $250K, or the equivalent of moving about 3 elementary schools to Tier 1. That was it. No further discussion or questions from the Board on that topic, although Director McLaren did mention the possibility of aligning the JAMS/Hale bell times for 2015-16, as part of the big changes planned for transportation. It is so frustrating that these bell times can't be aligned for 2014-15! It would help so much with the sharing of teachers between campuses, high school and middle school siblings could walk to school together, and Hale kids could help mentor after school programs at JAMS in order to meet their community service requirements. By sharing staff, there would be $$ savings in the long run, not to mention the late start would be a perk for get more kids in the door for its inaugural year. I honestly don't get it, but kudos to the future JAMS parents for writing in regarding the bell time alignment. I was mentioned that they had been hearing from the JAMS community, and that alone, is saying a lot for a school that has not yet opened its doors. I understand why this issue is important to you. I'm pretty sure the families at most middle and high schools would love to switch to the second or third tier next year. Our students would be happier, healthier and more successful academically. Siblings's schedules would be more closely aligned and we could eat breakfast together. Unfortunately, there isn't an extra $250K in the budget for any of us. I don't see how sharing staff would save money. If JAMS only needs a half-time French teacher next year, they will hire a half time teacher. Maybe Eckstein's French teacher will not have a full class load? All three of the JAMS feeder schools are in the second tier. Would it be possible to survey those families and see if they'd support a switch. There was 250k in the budget for JA k-8, though! There's always money for that k-8, and lots of it. Just not the neighborhood school. Sharing staff saves a lot of money. Hiring a half time teacher is more than 50% of the price of a whole teacher, not to mention availability. And the ability to actually teach a both schools, which is typically not possible because of commutes. They did not find $250K to spend on JAK-8 transportation next year. The board asked transportation to come up with a plan to save up to $5M. One suggestion made was to move the option K-8s to the first tier. I think the savings here would come from making it possible for more buses to run three separate routes a day. Option schools have longer bus routes than neighborhood schools. Someone (the board?) decided that the effect this would have on the youngest K-8 students was too great for the amount of money that could be saved. They simply chose not to make the change. "Option schools have longer bus routes than neighborhood schools." In the case of JAMS, its transportation service area spans two middle school attendance areas, JAMS and Eckstein, because the Board decided they would put APP there. The vast majority of kids living with the JAMS attendance area are in the 2 mile walk zone, and would not get transportation (unless they were SpEd students). Some of the APP kids from the Eckstein attendance area are also in the walk zone, but most in the Eckstein attendance area are not in the JAMS walk zone. Maybe it is a case of not being able to do it for all middle schools, and they didn't want to play favorites, but it sure would have helped boost the JAMS enrollment next year, perhaps enticing APP families who may be deciding between JAMS or Eckstein (which is closer to where most of the APP families live). Maybe it would keep folks from heading to Shoreline, where Kellogg MS has an 8:30 start (I've noticed there has been a resurgence of families moving to Shoreline recently). Filling the building, relieving Eckstein, and capturing/maintaining market share also saves money (and it IS apparently all about the money, and not about the education value of the choices being made), and would probably be worth the $250K in the long run. As someone who would not directly benefit from a later bell time for JAMS, I can certainly see your point. If all of a sudden, Whitman or Eckstein was going to have a later start time, and not any other middle school, I would be very annoyed. However, a bell time that is aligned Hale is not the same thing as a later start for some students. Everyone in the north end is relying on JAMS to relieve the severe over-crowding in the North end. As such, a strong start to JAMS benefits every single student. If JAMS starts strong, then not only will everyone get some breathing room, but it will most likely be possible to delay the start of Wilson Pacific so that those students don't start in interim housing. Moreover, there are real compelling reasons to start the bell time for JAMS aligned with Hale next year. There are almost 400 7th and 8th grade students who are being forcibly moved to this new school. These students never planned to transfer and many are going to have some significant disruption of some sort. A later start time, would go a long way to mitigate the upheaval. So does that make it unfair that some students will be starting a little later, Maybe? But it is unfair that some student are being made to move, Yes. IMHO, those two things will help balance that out. Then there is the cost savings. There are 4 portables on the JAMS property. If the Master schedules between Hale and JAMS are alligned then a single teacher could use that portable and teach both middle and high school classes and even some 8th/9th grade classes. This would ensure that every student that is required to move will be able to get their more advanced classes. @North-end Mom - that additional $250k you mention comes from having to add additional buses and drivers. That's assuming the vendor can find more qualified ones. There is already a shortage of drivers at the current vendor. It's one of the major reasons routes get delayed - there's really no ability to add more buses to a route when problems occur. The 3 tier system was "supposed" to save money but it really doesn't ultimately, because it was really never truly workable. In the end, it just puts more onus on families, requires more "extra" transports via taxi etc. At the Board work session on budget (Jan 30), there was a slide that showed a pretty large reduction in the buses that will be needed with the proposed plan for 2014-15 (312), a substantial reduction from this year (380). That doesn't include the buses needed for the four K-8s moving from Tier 1 to Tier 2, or grandfathering exceptions to some K-8s and option schools, which judging from the price tag of $500K (the difference in "savings") added an additional 10 buses to the mix. It sure would be nice if educational outcomes drove the transportation planning, but that doesn't seem to be the case. One last point. A footnote in this whole transportation package keeps getting missed. The busses for JAMS are almost exclusively for APP which is reimbursed by the State the following year at 100%. In response to the feedback that these busses don't actually cost anything. Transportation replied that the reimbursement ultimately covers 90% of the fully loaded costs. So that means the real cost of moving JAMS to be aligned with Hale is $25,000. Obviously well more than $25,000 would be saved in staffing costs with this plan. I wonder if that could be the focus of the first parent fundraiser and if they would move the tier. Interesting thought, using PTSA dollars to buy down JAMS transportation so that we could try to get a waiver (which are available, I hear, if your request is deemed cost-neutral). It's a pretty ambitious goal for a start-up PTSA, and it would be nice for us to be able to focus on things like making sure our low-income kids are supported by activity scholarships, have access to instruments, etc... Also, improvements/replacing the auditorium lighting, sound, etc... and a host of other needs that we will be facing as a brand new comprehensive middle school. But, then again, it is cheaper than what John Rogers PTA is forking out for our counselor position. Should we really, as a PTSA be expected to cough up $25,000 to try for a transportation waiver? Also, since it was a Board decision to make JAMS an APP site, instead of just a (very transportation-affordable) neighborhood draw, why is it the PTSA's responsibility to fund a waiver? That will be an interesting discussion at our PTSA meetings, for sure! Yes. There is only one vendor. That vendor is having trouble hiring enough qualified drivers to maintain current routes, and those drivers are contemplating a strike due to working conditions etc. And I'll just say this - don't believe everything you read in publically available documentation. There are many many things at play behind the scenes. Our java assignment help cluster provides assistance on an in depth type of every type theme with the help of administrations and enhances your critical work. If you're the java developer then you can make good effort on the online pattern and can take help with database design so that you can make good theme for this purpose. You can also make your application better in a good way which can give more advance technical style to the people who are interested. The parents and teacher meeting is very important and should be held at every week but you can get college accounting help from us. In this conference, the teacher gives the complete detail about the students and about the study. Such meeting is very helpful for the students to know about the problems of the students.